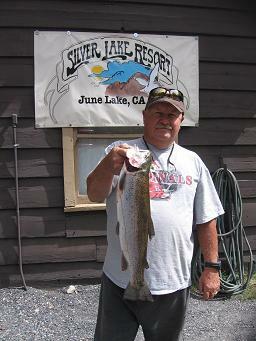 Sandy Roberts of Blythe caught a great 4lb 6 oz rainbow on Rush Creek using Garlic Power Bait. 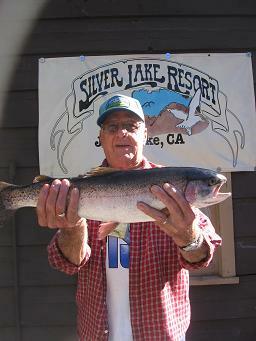 It may sound like a broken record but fishing at Silver lake and Rush Creek has been as good as ever. With over 1,000 pounds of fish being stocked into Silver Lake this week alone (900lb DFG and 125lbs Alpers) has continued to bring in nothing but stringers full of nice looking rainbows. We have not had many large size fish but the numbers of average size trout have been nice to see. The cold evenings and mornings are making us start to think about Fall just being around the corner. 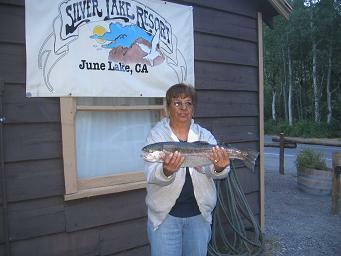 On Silver lake, Salmon Peach and Garlic have been working wonders for still fisherman and trolling with a Olive Matuka or Rainbow Hornberg near the surface have also been doing well. Worms have been doing nicely also on Rush Creek and the lake early in the morning or in the later afternoon. Grey hackle peacock or a Sierra bright Dot have been working well but that may change as the weather continues to get colder in the next few weeks. Good Luck and Happy Fishing!